The giaanee - the one who is spiritually awoken and one who has spiritual knowledge - the True Knowledge of braham; braham da gyaan - the True Knowledge of creator WaheGuru - that person is jeetha - has won over this world. Jag jeethaa sabh koe - has conquered over everyone. It also means that that gyaanee - that enlightened being has won the world, this world which has won over everyone, that world which defeated great conquerors such as Alexander the great - that world put even great warriors to their knees, that world has been won over by the enlightened one because man jeethai jag jeeth, as Guru Nanak Devjee says in Siri Japjee Sahib - that the person who has controlled the mind has taken over the whole world. A small story comes to mind when listening to this line of gurbani - when Alexander the great was going to conquer a country, in front of him lay a faqeer - a holy man and the holy man said to him, O Alexander! where are you going? He said, O I am going to conquer X country. The story is told in various ways. The Faqeer said: what will you do after that? He said, then I am going to conquer this country, then this country, then this and this. Then what is going to happen? Then I am going to conquer the whole world? Then what are you going to do? Then I am going to rest and the holy man laughed and said that you are going to go through all of that to do what I am doing now! Why not just do it now, what I am doing now? And that story tells us that the gyaani - has won over the world, win over yourself to put a control over your desires. Now that is the ultimate victory. How is that victory obtained? Through naamae - through god's name, through repetition of jaap - of god's name. Naamae kaaraj sidh hai - the affair of being enlightened is sidh - is completely fulfilled. 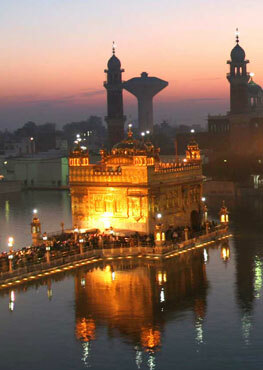 Sehajae hoe s hoe - whatever happens, it happens in celestial peace and by WaheGurujee's command. Through the Guru's math - through the Guru's understanding, that person's math - that persons' mind and soul become achal - become unmovable, their faith becomes unshakeable. Chalaae n sakai koe - nothing can shake their faith. Waheguru jee accepts his offering and accepts his bhagats and devotees as His own - angeekaar means to accept as His own. Kaaraj suhaavaa hoe - everything they do is blessed. Wherever they go they are blessed. Day and night they pass in jhagarraa - day and night they pass in arguments. Sabadh n karai veechaar - they never sit down to veechar, to understand, to contemplate the Guru's Word. It is as if karathai - Waheguru jee himself hir lee the sudh math - the discerning intellect, the true understanding. Bolan sabh vikaar - everything they do, whatever they speak they are always full of veekar, they are always full of sin. The world is always talking lust or desire or ego or anger or hate. Newspapers are full of all the bad things that happen in the world not the good things. We always talk about the bad, we always talk about the negative, we always talk about the things we don't like. Another characteristic of us is that we are never santhokheean - we are never satisfied. The manmukh is never satisfied with what they are given. Anthar thrisanaa - within them there is this greed - this fire of desire. Bahuth agaan andhaar - there is this great fire and this darkness of ignorance. Sathgurujee says manamukhaa naalahu thutteeaa bhalee - it's better to have broken all ties with those who are full of their mind. Jinaa maaeiaa mohi piaar - because they only love their attachment to this illusion. How can fear and doubt come near those people jun sathigur sir karathaar - who upon their heads have standing with them at all times that creator Waheguru, the True Guru. Waheguru jee themselves paij rakhadhaa - protects their honor. Aapae rakhanehaar - He Himself is the protector of all. When they are united with their preetham - their beloved they find sukh - they find happiness. Sachai sabath veechar - by contemplating the True shabad, the Guru's Word. Sathgurujee says, I've saeviaa - I've served the house of all peace, the giver of all peace. Aapae parakhanehaar - Wahegurujee Himself is the one Who judges and assesses where we are to go and what is to happen. O Waheguru jee all these jeea janth - all these creatures are Yours. Thoo sabhanaa raas - You are the shared treasure of all. The one who You give to sabh kish milai - he gets everything. koee hor sareek naahee thudh paas - there is no rival of You Waheguru, there is no equal to You ever. No one can even think of that. You are the One giver to all. Har pehi aradhaas - Waheguru jee You are the great giver and I offer this aradhaas - this prayer, this supplication before You. That person who pleases You, this dhee thoo mann laihi - You listen and You accept that person's aradhaas - that person's supplication. So jan saabaas - I meditate, I hail and I bow down to such a person, to such a humble saint. All of this is Your choj - Your wondrous play Waheguru. Dhukh sukh thudh paas - all pain and all happiness are with You, O Lord. Sathgurujee Maharaj is telling us those who have tamed their desires and followed the path of True, ultimate Love - they are the ones who have won in this world, they are the ones who leave this world triumphant.